Dr. Carlos Victor Costa has a three-decade career in the areas of corporate communications and marketing, with a PhD thesis in crisis management and online reputation. More at www.carlosvictorcosta.com. The dramatic images of the disintegration of a dam in the city of Brumadinho in Brazil on the 27th of January, and the subsequent tsunami of mud trashing everything on its way, is a tragic metaphor encapsulating the reputational collapse of one of the world’s largest mining companies, and the world’s largest iron-ore miner: Vale. Less than four years after an identical burst occurred in another dam in the same state of Brazil (in this case affecting a joint venture with Anglo-Australian company BHP Billiton), Vale faces a heavier blow to its reputation and business, in what is considered the largest environmental disaster in Brazil. The expected death toll from this disaster is almost 300 victims. As well, the company lost more than $14 billion of its value on the 28th of January in a share plunge on the Sao Paulo stock exchange, with a 25% drop in their stock. Crisis communication management in these circumstances is a daunting task. But data is a key ingredient to help any company in their response strategies. During the 2015 crisis, BHP used Meltwater’s Media Intelligence tool to monitor, analyse, update and alert the executive management team as the tragedy unfolded. For this article, we tracked the Brumadinho crisis with similar metrics, and a comparison between the two word clouds presents some similarities and differences in relation to the previous crisis. Typically, as in many similar crises related to environmental disasters (Bhopal, Fukushima, etc. ), this one has a name that will sadly remind us of the tragedy from now on: Brumadinho. Another aspect that we can notice from the keywords mentioned is the level of prominence taken by the name of Vale’s CEO, Mrs. Fabio Schvartsman, and of Brazil´s new president Mr. Jair Bolsonaro. Another very important data point is media exposure or reach, as research demonstrates that social media and the press have a pattern. One picks up themes from the other, sometimes in a feedback cycle. What we show here is a 20,000 ft perspective of a very complex crisis. But companies know they must pay attention to the conversation at a granular level, as a crisis management communication plan depends on how the company is perceived and what topics affect this perception – something that, today, does not respect the traditional news cycle of the past, and that can change at the speed of social media. How can data inform decision-makers in a crisis situation? First, it can inform about a key aspect when it comes to developing a communication strategy. All crises involve attribution of responsibility, as something went wrong and people need to make sense of the situation. Through the capture of data and expert analysis of the public discourse (content analysis), crisis managers can understand how the company’s responsibility is perceived. 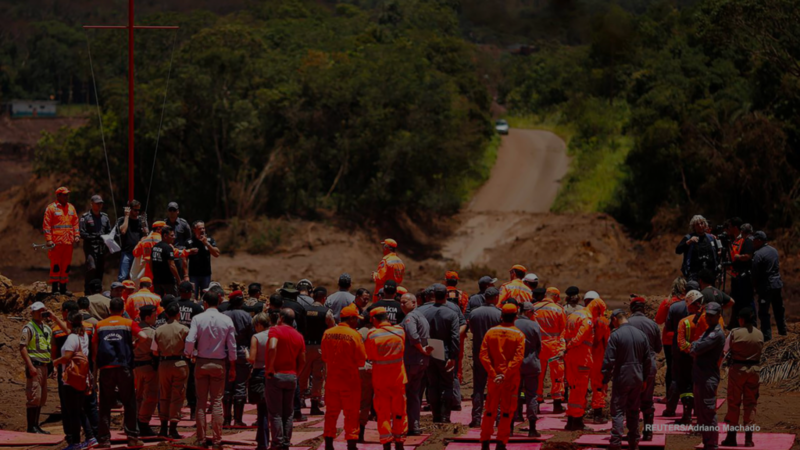 Using a basic classification of the crisis, the Brumadinho dam burst could be considered an accident, which is something that occurs despite the best intentions of the company. However, public opinion may see the event as a transgression, if the organization is perceived as having knowingly placed people at risk, having taken inappropriate actions or having violated laws or regulations. The difference between the two perspectives create two very different narratives for the company. The second fundamental role of data during a crisis is to assess the topics of discussion that originated around the event that triggered it. The dynamics of a crisis are characterized by a “snowball” effect of news which is uncovered by the media, rumours and the different versions of the story from multiple players and sources, each with its own interests. In this way, data is vital to identifying the ongoing conversation and the development of new focuses of a crisis for the company. In certain situations, for example, it’s not the accident that creates a reputational crisis, but poor handling of the press and communities (the US Federal government and BP responses to the Katrina Hurricane in 2005 and the Gulf of Mexico spill in 2010, respectively, are some examples that come to mind). I also recommend the use of data analytics in the case of crisis management to evaluate key networks and opinion leaders, and try to understand the “digital contagion”. A topic can be restrained to a certain group one day, but, through influencers, for example, can become a trending topic the next day. Bad news has a powerful way of spreading, and data is the only way it can be tracked. Finally, data can work as a thermometer, and the organisation can evaluate if their responses are helping to protect their reputation health, or if the situation is escalating. Media exposure and social media mentions, in this sense, are key metrics. A reputational crisis is always a crisis of second order, i.e. a consequence of some issue, mismanagement or disaster. Therefore, the area of crisis communications is a typical application of the Outside Inside approach, as the company is brought to the centre of the public opinion debate by external forces, usually the press, NGO’s, the government, customers or local communities. Understanding who is speaking, what is being said, and how it is said is the first step to addressing these very difficult situations and, eventually, repairing a reputation.